Insect populations in the tropics are facing a crisis as global warming drives up temperatures, causing a 98 percent decline in their numbers over the last four decades. Those are the findings of a new study published this week in the Proceedings of the National Academy of Sciences, which suggests that climate change is disrupting the global ecosystem at an accelerating pace. Worse, the study concludes that the problem is more widespread than scientists realized, with global warming triggering a "bottom-up" domino effect and resulting collapse of the forest food web, as insect-eating animals dwindle, too. Researchers say the consequences of a collapsed food web would have serious ramifications for the future stability of tropical ecosystems, which house two-thirds of the Earth's species. A disruption in the tropical food web would also have catastrophic repercussions for the global ecosystem, according to lead author Bradford Lister, a biologist at Rensselaer Polytechnic Institute. 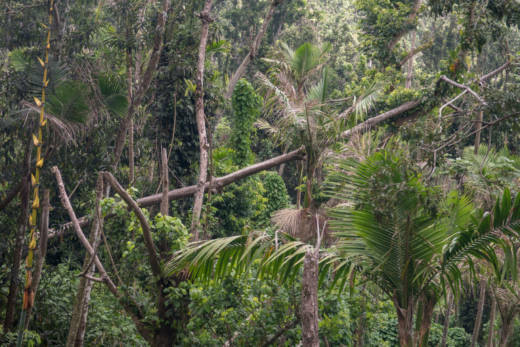 Loss of species in tropical rainforests are a sign that increased temperatures have begun to take their toll on the local climate, according to Lister. He warns that eventually the world could see dramatic changes in rainfall if tropical rainforests are degraded and vegetation starts to collapse, which is possible since pollinators are already crashing. That's because the global water cycle depends on plant life in these rainforests, which produce huge amounts of water that feed into rain flows carried by trade winds north and south of the equator. "It's happening all over the planet and once the pollinators crash, then the plants follow and you get accelerated extinction rates of a lot of animals and insects," says Lister. Lister points to the recent United Nations report on climate change to underscore the threat. The report lists 2040 as the year when the more severe impacts of global warming will start to unfold. "[I]n Central and South America, you're already seeing a 2 to 2.5 degree warming," says Lister. "We don't have to wait that long to see the impact of global warming. The damaging effects on the ecosystems that sustain us is already happening in tropical locations." For the study, researchers focused on the Luquillo Rainforest in Puerto Rico and Chamela forest in Mexico. In Puerto Rico, they compared data collected between 1976 and 2013, during which time the average temperature increased by two degrees Celsius (3.6 F). When Lister and his team returned to the island in 2013, he says he was surprised by how much the situation had changed. Researchers didn't observe any butterflies during the first two days, a considerable change from the 1970s, when Lister says butterflies could be spotted all over the forest. Lister says he also also noticed fewer flying insects in the air. "Just based on casual observations of the forest, we knew something was amiss," he says. There was also an obvious lack of birds that were once abundant such as the the Puerto Rican tody, which feeds almost exclusively on insects. For the data, Lister and his team collected insects using adhesive plates. They also swept the forest brush hundreds of times with nets, collecting any insects that passed through. They compared the results with previous measurements taken in the same way. They found that as temperatures increased,the biomass, or collective weight of insects declined by 98 percent. Specifically, researchers found that the biomass of insects captured by the adhesive traps declined 98 percent, while the net sweeps trapped between 12.5 and 25 percent of previous yields. Researchers also discovered contemporaneous declines in the forest's insect-eating populations such as lizards, frogs, and birds. The Puerto Rican tody for example, diminished by 90 percent. The ten most common species living in the forest canopy also experienced declines. Insect populations in western Mexico also saw declines of about 70 to 80 percent in biomass, while temperatures in this region climbed by 2.4 C (36.3°F) over the same period. One expert called the findings "one of the most disturbing articles" he had ever head. “This study in PNAS is a real wake-up call — a clarion call — that the phenomenon could be much, much bigger, and across many more ecosystems,” David Wagner, an expert in invertebrate conservation at the University of Connecticut, told the Washington Post. The findings corroborate similar findings from previous studies showing that global bug populations are declining at an alarming rate. A Stanford study in 2014 estimated that insect populations around the world declined by 45 percent in the last 35 years. Another study in 2017 showed a 76 percent decline in flying insects in German nature preserves. Researchers cite climate change as the cause of the dramatic declines based on a special statistical technique that allows scientists to single out specific variables — such as rainfall declines or increased temperatures — to determine their impact on the insects. The tool, according to Lister, pointed to higher temperatures as the culprit 90 percent of the time. Interestingly, almost all of the insects displayed the same proportion of declines, regardless of what species or forest niche they occupied. Lister says this indicates that an overarching force must be at play. His team plans on returning to these sites for newer measurements in 2020. "It's with a lot of trepidation that I head back because it's very disturbing to see what's been going on in the last 30 to 40 years," he says. "And if global temperatures keep increasing, the forests will eventually dry out." And while rainforests harbor most of the world's species, Lister says there have been few studies done on the impact of warming temperatures on tropical climates. He hopes his team's work stimulates more research on this topic.